This past summer I was getting in shape in anticipation of my wedding and I must have griped to my poor friend Tatiana about a million times that I was so frustrated trying to get rid of that little flabby area around my armpits. Seriously, I ate well, worked out, lifted weights, did my pushups and that little spot would not go away. I dedicate this post to my good friend Tat for patiently listening (and rolling her eyes a bit). I have finally found the workout that is toning up that underarm excess! These two exercises take less than 10 minutes to do, so they absolutely fit into my rule that anyone can get a good workout in at some point during their day. If you don’t have free weights pull out some cans of soup. They will do the trick. These exercises also work your biceps, triceps and shoulders. The perfect combination for beautifully toned arms. Stand with your feet hip width apart and bring the weights up in front of your sternum approximately a foot away from your chest with your elbows bent. 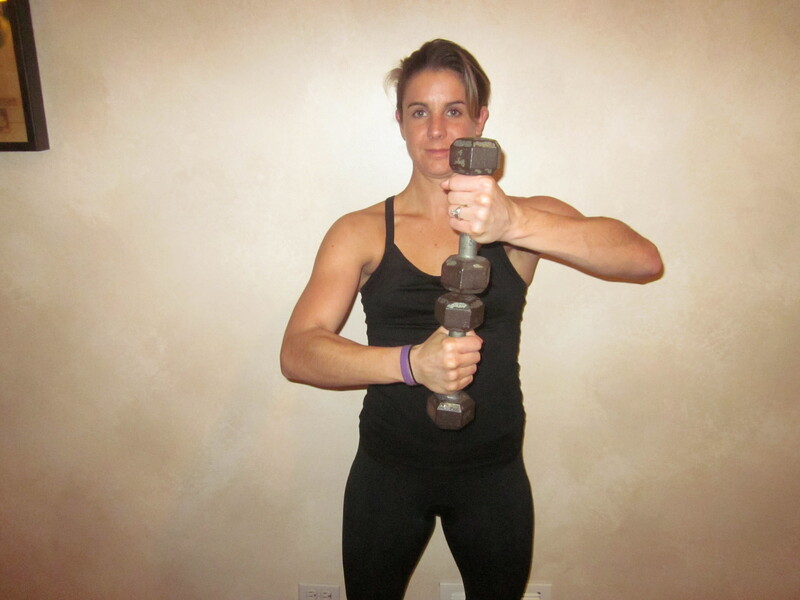 Lift your right arm with the weight above the other arm. Repeat with the left arm, raising it on top of the right weight. As you continue doing this keep those arms bent in front of the sternum so as you repeat lifting the weights you continue lowering the other arm back down so that you aren’t creeping upwards as you go. 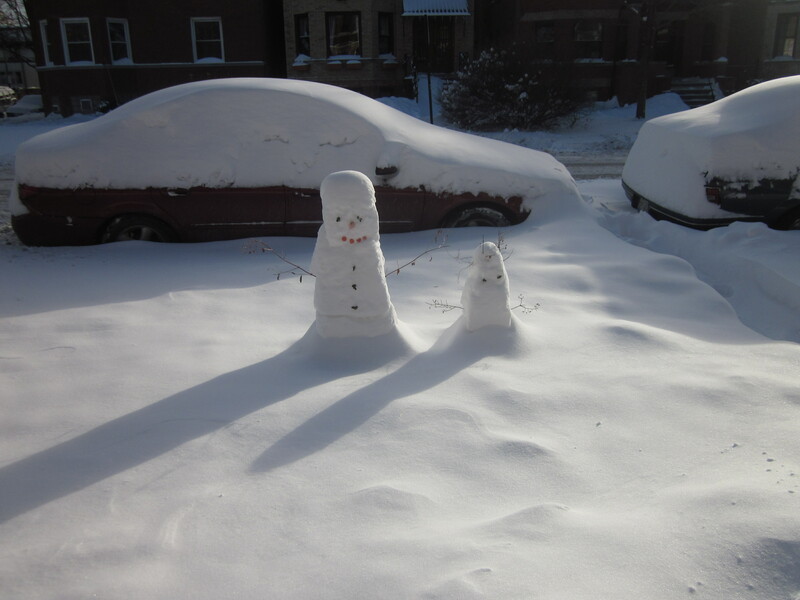 It will look like you are doing an imaginary stacking game that stays in place. Begin by doing this at 20 reps for 4 sets. I have now built up to doing 30 reps for 8 sets. 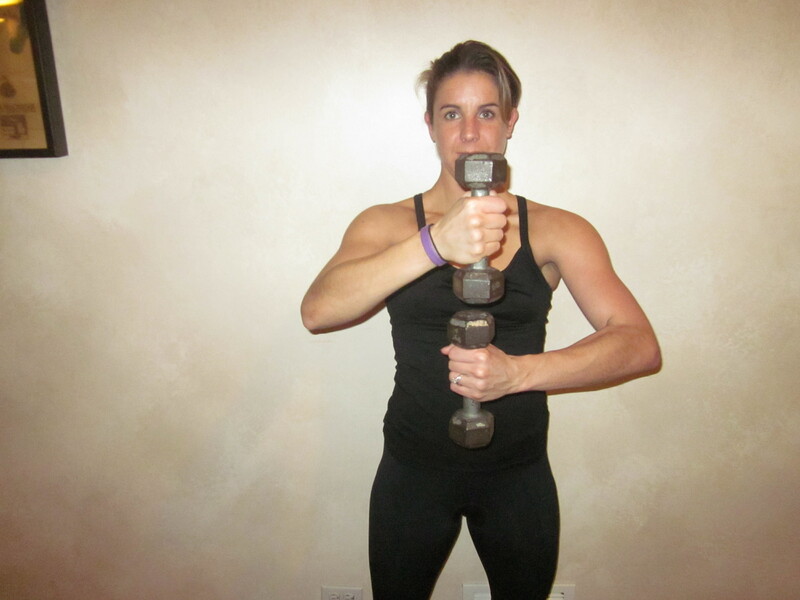 Hold those weights in your hands in the same position in front of your sternum with your elbows bent. Press the weights into each other and then start pushing them together (almost a pulsing motion). If you have a mirror you will see your arm pits actually engaging. 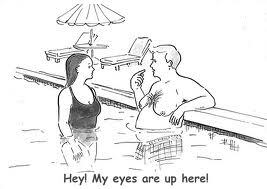 This also engages your pectorals so I recommend not doing this one out in the open at the gym as you might get a bit of attention from others. Begin with 40 reps for 4 sets. Learn to love that burn! Finally, I posted the other day that I had been eating the most delicious peanut butter pie. I had several requests for the recipe. The pie came from First Slice in Chicago. Check them out at www.firstslice.org. I don’t have the recipe for their awesome pie. But I do have a recipe for a peanut butter pie that my husband absolutely loves. It comes from Jessica Seinfeld’s “Double Delicious” cookbook. She adds healthy twists to her recipes and they are always pretty awesome. Keep in mind that Jessica calls for pureed vegetables in most of her recipes. I am lazy so I substitute baby food for pureed vegetables. Before you turn your nose, give it a try, my husband did and this recipe is always on his request list. Also, prune baby food makes a fantastic alternative for oil in many baking recipes. Try it in brownies for a tasty lighter version. You would never guess this is the lighter version! Preheat oven to 350º. Combine graham cracker crumbs and margarine and press into bottom 9 inch pie plate and up the sides. Bake for 5 minutes and then let cool. In large sauce pan on medium heat whisk together milk, cornstarch, 1/3 cup sugar, salt, and eggs. Stir occasionally and as it starts to thicken begin to stir constantly so no lumps form. Turn off the heat once it begins to boil and form a pudding consistency. Add vanilla extract and veggie puree. Pour half of the mixture into a bowl and add the 3 tbsp. sugar and peanut butter to this bowl and stir. Add the chocolate powder to the other half of the mixture and stir. 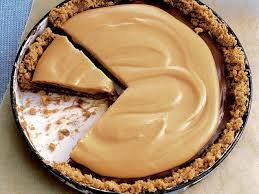 Pour the chocolate mixture onto the pie crust and top with the peanut butter layer. Cover and refrigerate for at least 2 hours. You can garnish with shaved chocolate or peanuts. I put this in the freezer and we eat it straight from there. It almost tastes like a peanut butter ice cream pie! A few years ago I was in the gym locker room and some girls were discussing their New Years Resolutions to go to the gym more and lose weight. A trainer overheard them and mentioned that she could train them as a group. 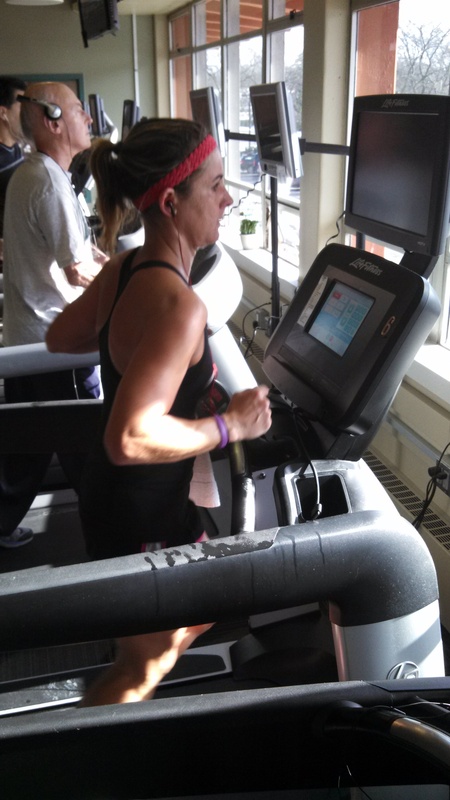 She told them it would be more fun that way as they could do their cardio on treadmills next to each other. “I love cardio but I don’t do treadmills,” one girl responded. The trainer said that wasn’t a problem and asked her what her preferred form of cardio was. “Free weights,” was the answer. The trainer told her that wasn’t a problem, they could do just that. I started to realize, there are a people out there who really want to get fit but just might not know where to start. Cardio involves your cardiovascular system; your heart, arteries, blood vessels, and the transporting of oxygen throughout your body. Your heart is the largest muscle in your body. If you aren’t working out your largest muscle, you aren’t giving your whole body a workout. The truth is, cardio isn’t easy. It takes some effort and some discomfort (often confused for as pain). Don’t get me wrong, I love a good free weight workout and I believe that should be part of your total exercise regiment. However, free weights can be done at a nice leisurely pace. Your heart, no matter how you do it, isn’t going to get the workout it needs. In order to lose weight, or for those who are looking to simply maintain weight and live a healthy lifestyle, you really need to aim for 30-45 minutes of cardiovascular activity 4-6 times per week. I prefer to aim on the higher end of that plan. It is okay if you don’t like to run. There are plenty of other options including: swimming, cycling, the elliptical machine, the stair mill, jumping rope, an aerobics class, spinning, rowing, crossfit, and a kettle bell workout. With all of these options there is something that you can find enjoyable and even better you can mix your workouts up during the week. To some extent you can use free weights in a circuit training workout to incorporate lifting and cardio, but it will likely not be to the intensity that your body needs. 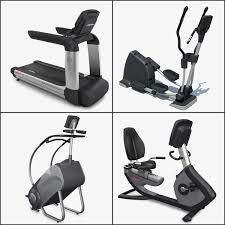 A few examples of cardio equipment. 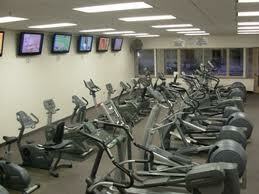 Look at the array of cardio equipment. Take a look around your gym or ask someone for help. If you prefer to walk this is also an option and is especially great for people who are older, injured, overweight, or are just starting to workout. Keep in mind that you should aim for a bit longer of a walk, closer to an hour at a time and keep the pace brisk. Strolling at the mall is not going to work your heart, just your pocketbook. If you are pressed for time you can break these workouts up. Do 20 minutes in the morning before you leave for work and finish with 20 minutes later in the evening or during lunch. Cardiovascular activities are not meant to be easy. You are going to feel your lungs burning, your heart pumping, and you are going to break a sweat. But you owe this to yourself and your health. Be honest with yourself and remember that it is only 30 minutes out of your entire day. Bring a magazine. When I first started running I ran on the treadmill reading US Weekly and other similar magazines (I knew all the best gossip for a few years). Put some headphones on and listen to some good music or a favorite podcast. 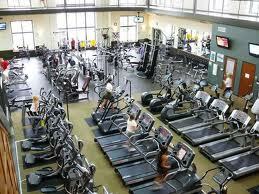 If your gym has TV’s on each machine you can simply get your cardio done as you watch a 30 minute show. Once you get started doing this for yourself, over time you will find that these kind of workouts can feel enjoyable. You will start to feel better about yourself and leave workouts pumped full of endorphins and energy. Don’t let the equipment intimidate you. I am so uncoordinated that when I get on the elliptical if takes me a few minutes to get my arms and legs in sync. I bet it’s amusing for those behind me! A special shout out to everyone running Disney this weekend and a special congrats to my friend Jill who completed her first 10k yesterday while running +1! 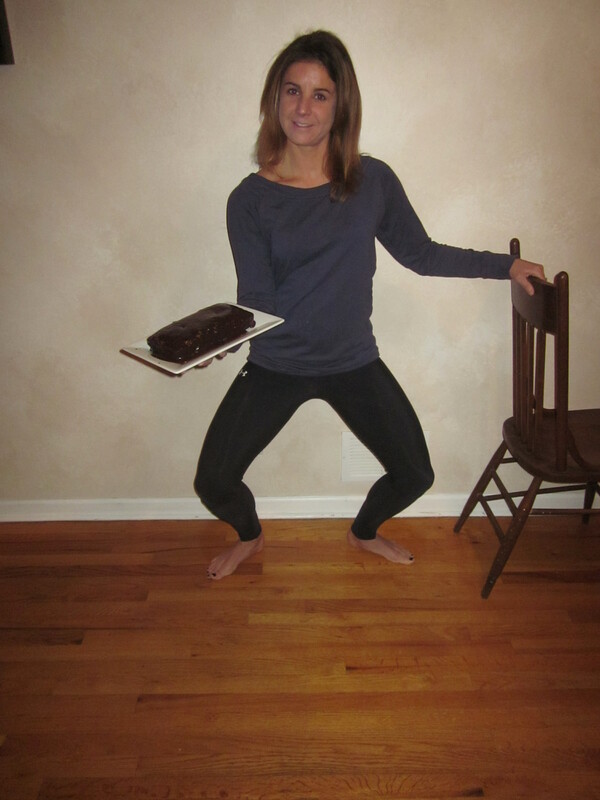 Finding My Inner Ballerina, and More Cake! Today was another freezing day in the Midwest and I spent it inside again. I was feeling a bit restless and wasn’t in the mood for another yoga class so I decided to do some research and try some new online classes. The cuter side of Hercules. My husband and I are going to Aruba in less than 3 weeks and I would like to do some post holiday reining in of the diet and tone up for some beach time. I have been reading a lot about all of the different barre classes that are offered and figured why not take advantage of my extra free time and turn the kitchen counter into my ballet studio. Note: you can also use a chair or a dresser as your barre. I spent some time reading reviews of free online classes that are offered and chose 4 that were highly recommended. Below are some highlights of the 4 classes I took today. This was a nice 30 minute workout lead by Sadie Lincoln. My legs were burning just a few minutes into this video. She uses a combination of ballet and yoga, although it seems a bit heavier on the yoga than other videos. To do this class you will want a set of free weights and a small exercise ball (I didn’t have one and it was just fine). Barre3 will work both your legs and arms equally. I found this class to be engaging and fun. I would try it again but I was looking for something a bit more focused on legs. This video is taped with just the instructor so it feels a bit more one-on-one. She does a great job of explaining each step and how to properly execute each move. This class was 20 minutes long and more leg focused than the above video. Barre Concept is much more ballet heavy leaving my legs burning which is just what I wanted. Some arm strengthening was involved but not as much as the Barre3. This video had my heart pumping which was nice to feel like I was incorporating some cardio into this strengthening class. Barre Concept is taped at a studio in the U.K. and I definitely enjoyed the energetic British teacher who lead this class. This video is taped with the instructor and 4 other women doing the class. It worked well, allowing her to show proper technique with the other students as well as modifications for making moves easier or harder. This video was 16 minutes long and done entirely on the floor as a bridge class. Word of warning, the instructor is truly a ballerina. When Mary Helen Bowers tells you to stretch, you feel silly because she can pull her legs into the craziest of positions with complete ease. At the beginning of the video she recommends coming into a simple stretch (pigeon pose) but there is nothing simple how she goes about it. Don’t be put off by her extreme flexibility and gorgeous ballerina legs…just imagine that’s what you will get after her 16 minute workout! Ballet Beautiful is heavy on the stretching but I noted that this would be an excellent workout to use as a start to your day. The light piano music in the background was very peaceful and despite being on your back the entire workout my legs were really feeling it. This class is filmed with just the instructor. I thought she seemed very sweet and had great explanations and modifications. This 12 minute workout was good but I noted that it was just ok compared to the others. What I did like was the instructor mentioned that all classes are based on an interval method to help boost your metabolism. Barre Body uses a combination of ballet, yoga and pilates which is probably why I enjoyed it the least. I was mostly looking to find a leg toning ballet concept class but that is not to say that you wouldn’t enjoy this class. The instructor however, was very engaging and gave great explanations for each step. I personally just never felt any cardio during the class, nor were my legs getting the burn I was hoping to find. It was so good! 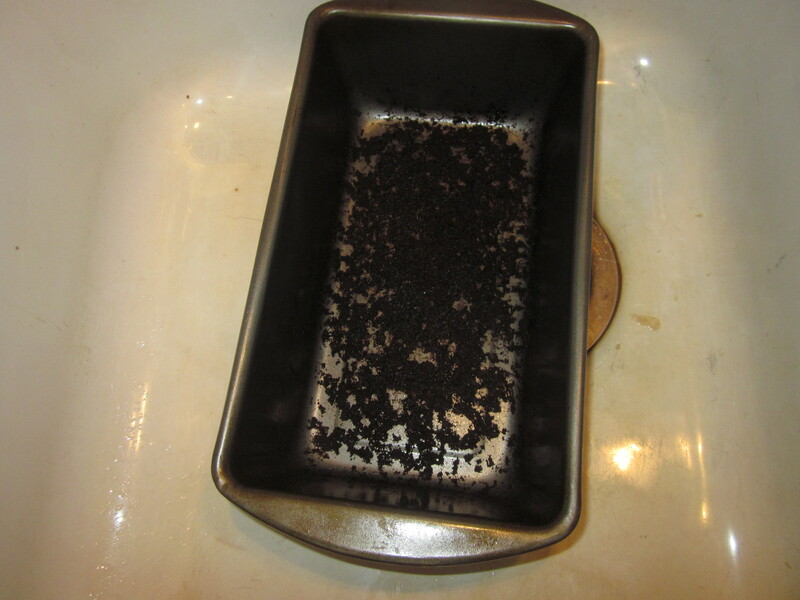 That is what is left from the cake the night before last. This was not a video, otherwise it would have been marked my favorite. 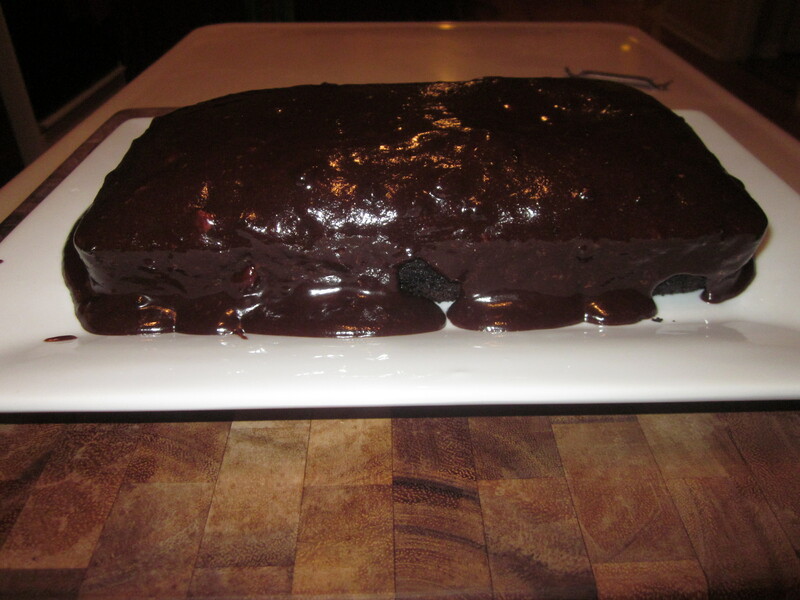 Yesterday I mentioned that I made Bethenny Frankel’s How Is This So Moist Cake with Chocolate Peanut Butter Glaze. A few people asked me about this so I am adding this recipe. It contains no eggs or butter and calls for oat flour (although I used regular flour because that is what I had) making them gluten free and an option for vegans. Preheat oven to 350º. Mix all of the ingredients together in a bowl and stir to combine. Pour batter into a loaf pan coated with cooking spray. Bake 40-50 minutes until done. Once cool cover with glaze. Combine and stir, pour on cake and eat! I still have moments where I am amazed and in love with being in the Midwest. This is the latest. That my friends, is the Chicago style of valet parking. 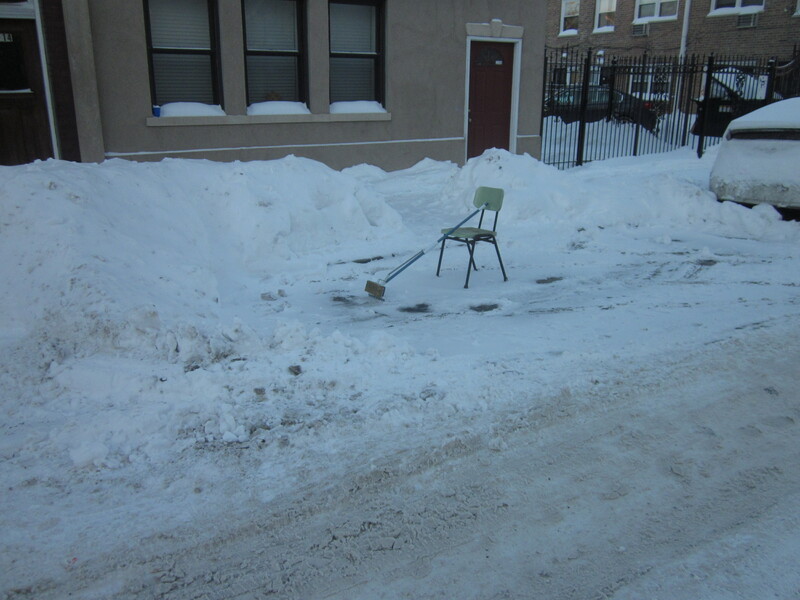 Apparently when you dig yourself out in the morning you put out a chair or something else to mark your spot and people respect it enough to leave it for you to return. This amazes me because in New York someone might steal a cab from an elderly woman if she didn’t sprint to hop in. You gotta love this place!